for adults and children four or more years of age. 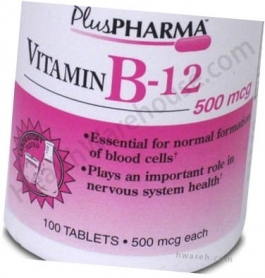 Vitamin B12 is a water-soluble vitamin. It is needed for normal nerve cell activity and DNA replication. Vitamin B12 also aids in the production of the mood-affecting substance SAMe. This versatile vitamin gives you the nutrients you need to increase energy, decrease stress, and combat memory loss and chronic fatigue. Vitamin B12 is naturally found in foods that come from animals, including fish, meat, poultry, eggs, milk, and milk products. Fortified breakfast cereals are a particularly valuable source of Vitamin B12 for vegetarians. Take 1 TABLET daily with water, as a dietary supplement or as directed by a doctor. Dicalcium phosphate, hydrated amorphous silica, magnesium stearate, microcrystalline cellulose, stearic acid.